Palm oil in many products. But why? Here we explain uses for palm oil. Companies use palm oil in foods, medicine, self-care and beauty items, cleaning products, and more. According to The Wall Street Journal, palm oil is the most widely used vegetable oil in the world. Approximately half of packaged products in supermarkets contain palm oil or palm oil derivatives. Palm oil is an inexpensive and versatile oil which makes it practical for companies to use. There are hundreds of names for palm oil derivatives; most do not contain the word “palm-” in the ingredients. So, what is palm oil used for? What are the ways companies use palm oil? The U.S. Food and Drug Administration (FDA) banned the use of Partially Hydrogenated Oils (PHOs) in foods. These are known as trans fats. 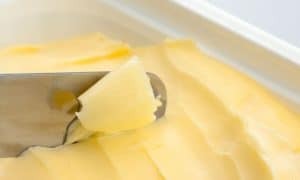 Before the 2018 ban, food companies used trans fats in baked goods, ice cream, margarine, butter spreads, canned frosting, shortening, frozen products, dough, candy, frozen meals, and more. Companies turned to palm oil which is virtually free from trans fats. Food manufacturers now use palm oil because it mimics “what’s good about” trans fats. Palm oil helps to thicken foods, adding creaminess. Manufacturers use palm oil for this reason in foods such as ice cream, margarine, buttery spreads, frosting, chocolate and hazelnut spread, salad dressing, gravy in jars, chocolate, caramel, whipped topping, etc. You may see palm oil in brands that highlight their “no stir” labeling. Companies use palm oil in canned frosting, ice cream, hazelnut and chocolate spread, buttery spreads and margarine and other foods in which consumers want to be able to spread or stir the product. Palm oil acts as a preservative. Companies use palm oil and palm oil derivatives so products stay fresher longer on store shelves. They want the crackers and cookies to stay crunchy, the sliced bread to stay fresh, and the cereals and granola bars to stay crispy. For this reason, palm oil is used in these types of foods: boxed cake mix, snack foods, pre-packaged bakery, canned shoestring potatoes and potato crisps, canned French fried onions, jerky, candy and gum, etc. Palm oil is used to make foods chewy, gummy, or stretchy. This is especially common in these types of non-chocolate and chocolate candy. It’s also very common in ready-to-eat (RTE) cereals as well as in snack and protein bars. Palm oil helps in foods stay intact while frozen. You will find it in frozen desserts, including ice cream, sherbet, cake, pie, ice cream novelties, frozen meals, and in frozen pizza. Companies use palm oil as an emulsifier to stabilize processed foods and prevent them from separating. It’s used for this purpose in margarine, baked goods, packaged frosting and icing, salad oils, whipped cream topping, condensed and evaporated milk, non-dairy creamer, and caramel. If you read ingredient labels for foods that have a coating or that are meant to coat, you will likely find palm oil or palm kernel oil. Some examples include fondant, almond bark, yogurt-covered and chocolate-covered pretzels, snack bars, chocolate candy, baked goods, ice cream toppings, and chocolate coating on ice cream cones. In addition, palm oil is able to create the shiny appearance in foods. You will find palm oil in confectionery, coated snack bars, in yogurt- and chocolate-covered foods, and in bakery. Another application for palm oil is to replace ingredients. Palm oil can be a substitute while still maintaining the integrity of the product — providing stability, mouthfeel, texture, etc. Manufacturers use palm oil in caramel, butterscotch and many candies, in baking chips, dairy-free and low fat cheese, ice cream, creamer, condensed and evaporated milk, and more. Many gluten free and vegan foods such as crackers, butter, and cheese will use palm oil as replacements. Even in foods in which companies aren’t eliminating ingredients, one of the big uses for palm oil is to enhance the mouthfeel and texture in foods. You will find it in pizza dough, candy, whipped topping, refrigerated cookie dough, gravy, hamburger, sausage, ice cream, buttery spreads, margarine, creams and fillings, and cookies and desserts. Manufacturers use palm oil to pre-cook foods before selling them. 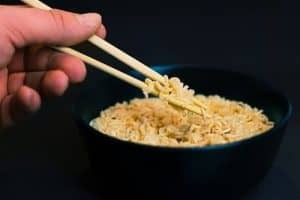 Think of foods such as ramen noodles in which the consumer adds hot water before eating. Palm oil is mac ‘n cheese, noodle soups, and other RTE instant foods. There are many uses for palm oil derivatives in foods, including Propylene Glycol. This is one of several palm oil derivatives that works well as an anti-caking agent. Manufacturers use these anti-caking agents in soup and dip mix, powdered drink mix, grated cheese, pizza dough, candy, spices, cake mix, in addition to many more foods. Manufacturers and bakers use palm oil to increase volume in biscuits, bread and baked goods. As a result, palm oil gives these products a better appearance. Also, according to Bakerpedia.com, it’s the only vegetable oil with an approximate 50/50 makeup of unsaturated fatty acids and saturated fatty acids. It acts similarly to butter in baked goods. Some products need to be able to absorb water and/or to retain moisture. Companies use palm oil for this purpose in extracts, such as vanilla and almond, and some brands of food coloring. What else is palm oil used in? As a humectant, companies use palm oil in baked goods, prepared foods, drink mixes, fondant, and cake mixes. Another one of the uses for palm oil is to replace lard. Palm oil works well in this capacity because its saturated – monounsaturated – polyunsaturated ratio is similar to lard. Palm oil uses include fortification. Companies use palm oil derivatives to supplement milk, RTE cereals and other foods which require fortification. As an example, if you see a Vitamin A content of 10% or greater, it’s most likely in the form of Vitamin A Palmitate, a palm oil derivative. You will see Vitamin E in the form of Tocopherols or Tocotrienols (typically from red palm oil) which is in foods, vitamins and more. Supplements, vitamins, and over-the-counter (OTC) and prescription medications are products that contain palm oil. Palm oil is used in all forms: capsules, chewables, gel caps, liquid medications, and tablets. Common palm oil derivatives to look for are Propylene Glycol, Glycerin, Vitamin A Palmitate, Polysorbate 80, Polyethylene Glycol, and Magnesium Stearate. See medicine without palm oil for our experience with a compounding pharmacy. Manufacturers use palm oil to maintain moisture in supplements, vitamins and medications. Glycerin helps the ingredients to dissolve in the formula. Manufacturers use palm oil derivatives to coat capsules and to maintain the shape of the capsules, etc. 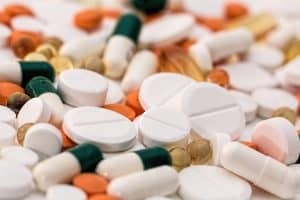 Magnesium Stearate ensures the capsules and tablets don’t stick to the machines. Additional uses for palm oil are to help extend the shelf-life of medications. You will find it in liquid formulas especially for this reason. Companies use palm oil as a solvent in liquid formulas, including many OTC children’s and adult pain relief medications, allergy medications, and fever reducers. Propylene Glycol is a common vehicle for many drugs. Glycerin is often used as a solvent. 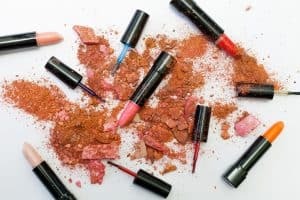 Companies use palm oil and palm oil derivatives in many common self-care products, beauty products, and household cleaning products you use regularly. Here are some of the ways and the products that contain palm oil. Palm oil is used to create the sudsy attributes consumers associate with cleaning products. This is one of the many palm oil uses for hair. You will find palm oil derivatives in these types of products: liquid and bar soap, bubble bath, baby wash, mouthwash, shampoo, toothpaste, laundry detergent, dishwasher soap, etc. Manufacturers use palm oil to keep dirt in suspension in products such as pod-type laundry and dishwasher detergents. Palm oil makes for an inexpensive cleansing agent. This is one of the many palm oil uses for skin and household cleaning products. You will see palm oil derivatives used for this purpose in shampoo, 2-in-1 shampoo and conditioner, liquid soap, liquid and powder laundry detergent, and toothpaste. If you see products that have a pearlized look, they very well may contain palm oil derivatives. Examples include: shampoo, conditioner, lotion, moisturizer, creams, serum, etc. Palm oil helps in hair gel and wax, shaving cream, solid deodorant, bar soap, sunscreen sticks, liquid foundation, creams, and more. Also, companies use palm oil so products can remain solid at room temperature. Palm oil is tasteless, so it works especially well in lipstick and lip balm. Palm oil is used as a processing aid for ingredients to combine. Some examples of products that contain palm oil are pod-type detergents, liquid detergents, sunscreen, cosmetics, and more. Just like with some food products, companies use palm oil to provide moisture. You will find it in teeth whitening strips, cosmetics, shampoo, conditioner, sunscreen, and other products. Some examples of the ways companies use palm oil to hydrate the mouth are in mouthwash and toothpaste. Palm oil derivatives enable products to spread on the skin easily. Because of this, uses for palm oil are common in lotions, moisturizers, serums, foundations, and creams. Products that contain palm oil for this purpose include laundry boosters, liquid laundry detergent, powder laundry and dishwasher detergents, etc. Companies use palm oil as a surfactant in liquid and powder laundry detergents, flushable wipes, shampoo, solid deodorant, and more. You will find palm oil in products such as flushable wipes, solid deodorant, and sunscreen. It’s also in cosmetics, including eyeliner, mascara, eye shadow, lipstick, powder, and foundation. It’s in tissue with lotion. According to a large manufacturer’s website, it enables tissue to glide over skin. Products that contain palm oil include wet floor cleaning cloths, tissue with lotion, teeth whitening strips, and more. Manufacturers use palm oil in lotions and in face and body polish and scrubs to exfoliate the skin. According to worldwildlife.org, palm oil is in shampoo to help restore natural oils that shampoos strip away. Body wash and soap manufacturers use palm oil in their products to help stabilize the lather. Most people use many products with palm oil ingredients every day. In addition to all of the above products, you can also find palm oil in bio-fuel, industrial lubricants, waxes, polishes and more. Here are some ways to find palm oil free products. Why is palm oil in everything? Above we explained some of the uses for palm oil in foods, vitamins and medicine, self-care products, beauty products, and cleaning products. When you account for the hundreds of palm oil derivatives, you can see how it is able to take on many forms for many different types of applications. Palm oil and palm kernel oil do not contain trans fats. Because the FDA banned trans fats, food manufacturers had to find replacement ingredients. They are now using palm oil. Frequently, palm oil and palm oil derivatives work to serve more than one purpose in a product, making it that much more valuable. In addition to being a versatile oil with many applications, palm oil is inexpensive. 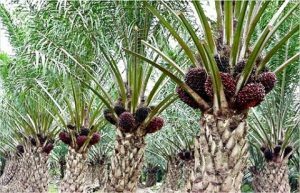 According to industry experts, oil palm produces 4 – 10 times more oil than soy, sunflower and rapeseed. It’s a very productive crop with the highest yield of any oil crop. It has the most oil produced per hectare per year. As a result, palm oil is the cheapest vegetable oil to produce and refine. There are many companies who promote their healthy, green, eco-friendly, and/or plant-derived ingredients. Read labels as oftentimes, these products contain palm oil derivatives. Because palm oil is trans fat free, has many unique characteristics, is a versatile oil, and is cheaper than other oils, global demand for palm oil has nearly tripled since 2000. There are numerous uses for palm oil in foods, cleaning products, medicines, self-care products, and cosmetics. Many chemicals in everyday products are made from palm oil. Companies have found many ways to use this versatile oil which is why there are so many products with palm oil.